Industrial Strength Samples returns with another sizzling Hardstyle sample pack from Gancher & Ruin. Hardstyle has gained formidable force on the dance floor, the Dutch style leaking into so much modern dance music that Gancher & Ruin thought it was time to rock out a set of Construction Kits so you can develop your own Hardstyle tracks in no time flat. Producers looking for huge kick drums, slick sounds and ripping riffs need to look no further—this 100% license-free pack delivers the goods. This pack features 24-bit, 44.1 kHz Wav files, perfectly edited, keyed and labeled for ease of use in any Daw. For more Hardstyle power, match Radical Hardstyle Kits with Gancher & Ruin's Hardstyle Rituals oneshot pack. When these two packs are paired, they become a formidable source for creating Hardstyle dance tracks like no other. This pack features drums, music loops, leads and oneshots, all preloaded in NI Battery 4 so you can create your own drum patterns quickly with this powerful Native Instruments drum plug-in. 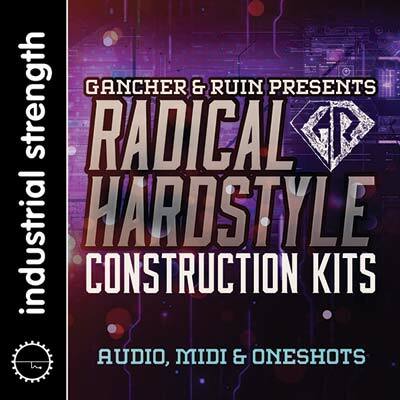 If you’re looking to get inspired, or want to take your next production or remix up a notch by adding fierce Hardstyle elements, Gancher & Ruin's Radical Hardstyle Kits supply the sonic essentials needed to send you on your way.